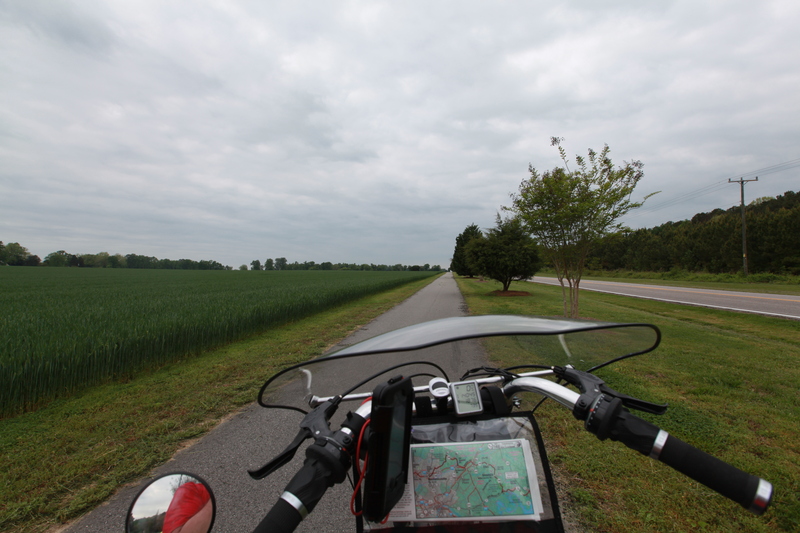 Day 2: Battlefields and Bailing Weight: Jamestown, VA to Ashland,VA | Mike Evans. Camping the first night after a strenuous ride was great. I slept soundly and woke up with only minor soreness. As I mussed about with getting my stuff all organized and packed away I thought again, ‘I’ve got too much crap’. Less stuff is easier to organize, and less time after waking before getting rolling. 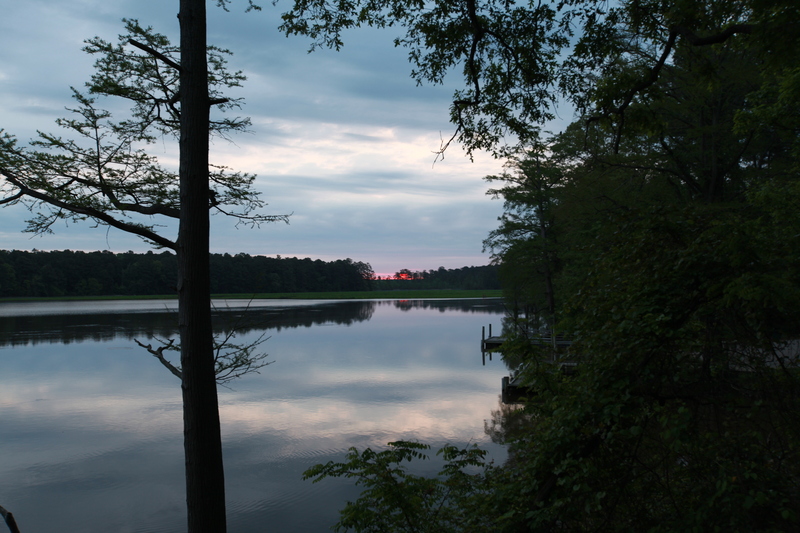 Fortunately, my dilly dallying gave me a shot of the sun creeping up over the Chickahominy river. You can only see the top because I was impatient to get going. My maps told me that highway 5 between the river and Richmond got very busy, so I figured at 6:00 I’d be beating a lot of traffic. The sun just peaking out over the Chickahominy river. A beautiful bike trail with an old plantation on the left. Battlefields are usually at the top of hills. One army decides to defend it against the assailant, and as Anakin Skywalker found out the hard way, the high ground is a valuable advantage. (Obi Wan should have remembered that before fighting on the Death Star… though, that begs the question of whether they’d be slightly concave because of it’s spherical nature.) At any rate, I re-discovered this concept of elevated battlegrounds as the “Richmond Battlefield Park” is at the top of Malvern Hill. I’ve got to get rid of some crap. 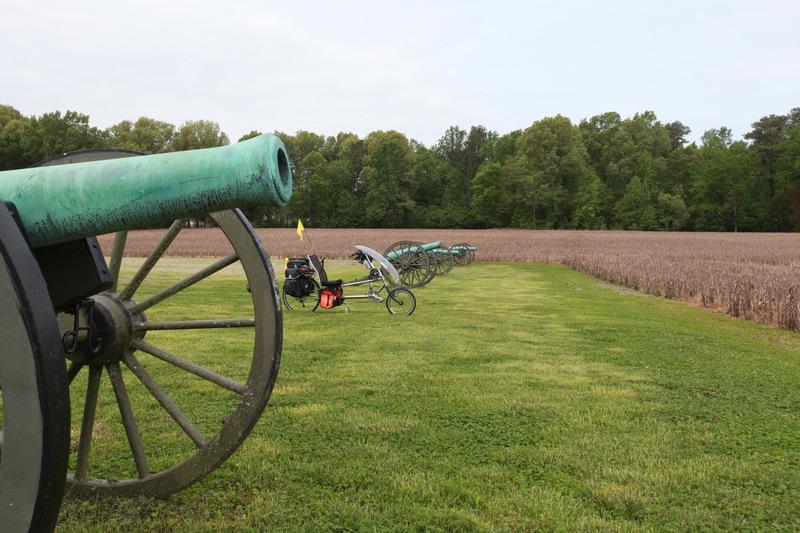 At Malvern hill, I met Tim (Hi Tim!). He has the distinction of being the first person to ask if I was blogging this, so he got my first card. Since I was panting out of breath, the topic of hills and battlefields came up. 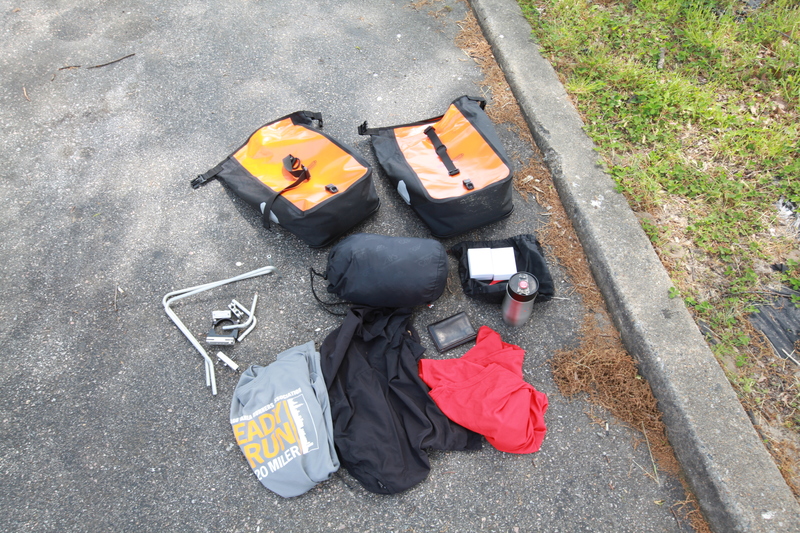 He pointed out that a lot of Appalacian Trail hikers dump a bunch of weight after the first day and a half. I’ve got to get rid of some crap. Speaking of battlefields, for some reason, there was a gap in the Union line of cannons. So, I reinforced the line. Those rebs will never take Malvern Hill now! In the town of Glendale I received a shock that my perspective has already started to shift from this trip. There was a grocery store there in town where I stocked up on victuals. Notably fried chicken. I’d give this fried chicky about a 4 out of 10. But, after 30 miles on a bike, one can add +4 to everything. (It is a magical bike of +4 victual effectiveness). As the clerk rang me up we exchanged the pleasant ‘have a good days’ that smooth relations far better than the theory that an armed society is a polite society. In response to my “have a good day” she replied “for sure I will!” And methoughts, ‘Huh, what day is today?’ Who woulda thunk that after just 2 days of riding I would have already stopped caring about the day of the week? Sweet. 9lbs 8oz of crap got mailed home. And so I continued on, rolling the last 10 miles with little notable. Except of course, an ice cream sandwich from 7-11. So far, I’m 2 for 2 on ice cream sandwich days. Yum. I also purchased 32oz of ice coffee to fill my Nalgene bottle. Double Yum. Overall, I’m much less tired than yesterday. You can probably tell on account of my witty prose. I love the last photo so much. It’s poetic that otherwise useful things can turn into crap when you have to haul them yourself for a few thousand miles. As the only other “character” in this saga, your bike is slowly turning into Wilson from the movie “Castaway”.